100 Perfect Pairings: Main Dishes to Enjoy with Wines You Love By Jill Silverman Hough helps you prepare main dishes that will perfectly complement the wines of your choice. An ideal resource for both casual dinners and special occasions, this handy book presents 100 main dish recipes that pair deliciously with favorites like Chardonnay (Roast Chicken with Potatoes) and Merlot (Mixed Mushroom Pappardelle). Organized into 12 chapters (six for white, six for red) and illustrated with 40 lush color photos, 100 Perfect Pairings makes it easy to match a variety of main dishes with your favorite wines. I’ve said it before and I’ll say it again now: writing and publishing a successful cookbook is not an easy task as the market is saturated with tens of thousands of cookbooks and it seems a new one arrives every hour of the day. But let me say right now that ‘100 Perfect Pairings’ is a good cookbook; it is well thought out and the recipes are well detailed and if you read them through and follow them the end result is very delicious. This cookbook is all about pairing wines with foods, but I discovered that even if you forget about pairing the wines, the recipes are very, very good. They range from up-scale sandwiches to full-blown entree’s. Colorful illustrations make you want to rush into the kitchen and get working. ‘Hosin Pork Tenderloin with Asian Salad’ is an excellent recipe with a very nice photograph of the finished dish, mouth-watering enough that I wanted to prepare it for lunch, not wanting to wait for dinner. The ‘onion and apple tart’ is a must! Once again the accompanying photograph makes your mouth water and your soul long for it and although at first blush the recipe looks somewhat complicated it is very detailed and it works out very well, easy to do, producing a final product worthy of a five-star rating! ‘Pork Loin Roast with dried cranberry Stuffing’ is also a mouth-watering, certain to please entrée; while appearing somewhat complicated it is easy to prepare if you read through the instructions on how to prepare the loin before you begin. Having a good, very sharp knife is a must for this recipe. This cookbook is good for experienced as well as beginning cooks as the recipes are so well thought out and detailed. And if you like wines, you’ll discover the suggested pairings are also very well thought out and make great companions for the recipes. The author obviously knows her wines and is an accomplished cook; the fact that she took the time to make the recipes easy to follow and easy to transform into appealing, delicious food that every cook will be pleased to offer is a genuine accomplishment. 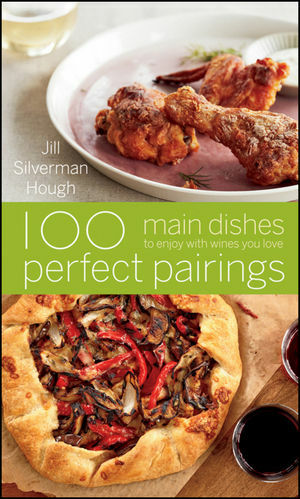 ‘100 Perfect Pairings” definitely belongs in your kitchen or on the shelf next to your other cookbooks. It’s a real keeper, one you’ll turn to again and again. Cake Decorating for Dummies looks good! I would love to have Canning & Preserving All-in-One For Dummies! Another book I would like to have is How to Eat: The Pleasures and Principles of Good Food. Thanks! Wiley has so many food and drink books that I would love: Students’ Vegetarian Meals For Dummies, the Encyclopedia of Jewish Food, God in the Cup (the one about the perfect cup of coffee)…I could go on and on! I must know the recipe for apple and onion tart!! I recommended this post on Facebook. I would also enjoy the ‘So Easy Slow Cooker’ cookbook. I would like the Better Homes and Gardens New Cookbook because my old one is in pieces! The weight watchers in 20 minutes would be nice to have! I am interested in “Sandra Lee Semi-Homemade Money-Saving Slow-Cooking: 129 Quick-to-Cook Meals”. I like the Weight Watchers In 20 Minutes. Better Homes and Gardens Garden Fresh Meals. I think I would enjoy International Cuisine.